1. Preheat the oven to 220°C or gas mark 8. 5. Stir in the yeast. 6. Make a well in the centre of the flour and add warm water. 7. Work into a soft dough with your hand. 8. Turn onto a lightly floured surface and knead for 5 – 10 minutes until smooth. 9. Place the dough in the bowl. Cover with cling film and prove in a warm place until doubled in size. 10. Turn dough onto a lightly floured surface and knead. Divide the dough into 8 equal pieces. 11. Pat and roll each piece into an oval shape and place on the baking tray. 12. 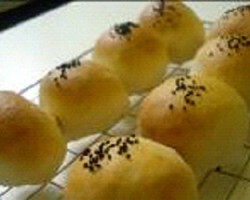 Brush bread rolls with a little milk and sprinkle with poppy or sesame seeds, if desired. 13. Bake for 10 minutes, until the rolls sound hollow when tapped on the base. 14. Place on the cooling rack. Vary the toppings on the rolls, but be aware of allergies students may have. You can add herbs to the bread dough. You may need to add a little more liquid, if you use wholemeal flour.